The newest target in the American-led campaign against ISIS isn't its fighters, its weapon caches, or its training camps, but rather its main source of revenue: oil. The oft-sang refrain about ISIS, aside from its brutality (which President Obamamuscularly addressed at the United Nations on Wednesday) is the group's startling ability to make upwards of $2 million per day selling oil. Seeking to disrupt the financial operations of the "wealthiest terrorist group in history," the coalition, as Reuters reports, has attacked the Islamic State's oilfields. The air strikes early on Friday hit Islamic State bases and positions on the outskirts of the city of al-Mayadin in Deir al-Zor province, said the Britain-based Syrian Observatory for Human Rights, which monitors the conflict through a network of sources. 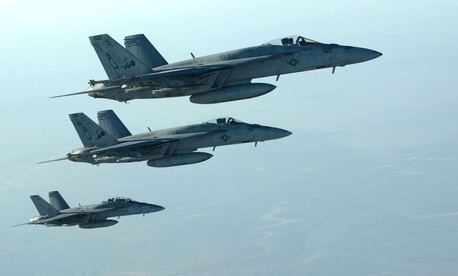 An earlier air strike hit the al-Tanak oilfield area in the province, while apparent missile strikes -- also thought to be carried out by U.S.-led forces -- hit the al-Quriyah area, also in Deir al-Zor, the monitoring group said. As we noted earlier this month, one of the main beneficiaries of the ISIS oil industry has been neighboring Turkey, whose ruling elite has been accused of buying the black market black gold. This arrangement as well as some overarching strategic goals about the Syrian civil war is part of what has kept Turkey, a fellow NATO member, from fully investing in the U.S.-led effort to stop ISIS. #Turkey complains that its being treated unfairly by certain circles for criticism re: ISIS, but refuses to say what its doing to combat it. That might all be changing. Earlier this week, Turkey secured the release of nearly 50 hostages who were being held captive by Islamic State fighters in the Iraqi city of Mosul. Once viewed as an impediment to Turkish involvement in the battle against ISIS, the end of the hostage crisis rids Turkey of one of its best excuses to stay on the sidelines. We'll always get more than people think we're officially getting, and we're always going to get less than what we would want. In the end, Turkey will come along."